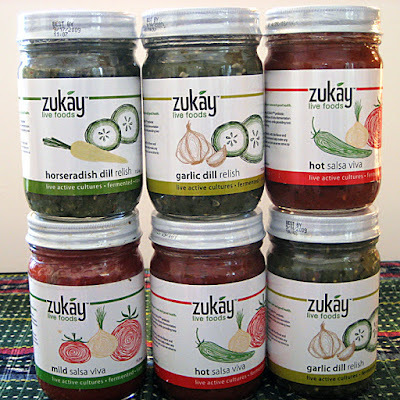 Yesterday I arrived home from work to find that Scott, Cathy and Jacob Grzybek, from Zukay Live Foods, had sent me a complimentary shipment of six jars of their raw, naturally fermented salsas and relishes. These are fresh, whole foods that have been fermented with friendly lactobacillis bacteria, preserving the food and giving it the same healthful benefits as yogurt. I received mild and hot salsa, garlic relish and horseradish relish. These products are supposed to be good for digestion and general health, literally bursting, as they are, with life. Scott, Cathy and Jacob use no chemicals or preservatives—just a small bit of raw apple cider vinegar in the relishes. The jars came with a warning that because the contents are a live food, they may exhibit activity as the jar is opened. We experienced this with the hot salsa as it became a mini-volcano and rose up an inch out of the jar and over the edge! I was prepared with a spoon and bowl to quickly corral the runaway salsa. 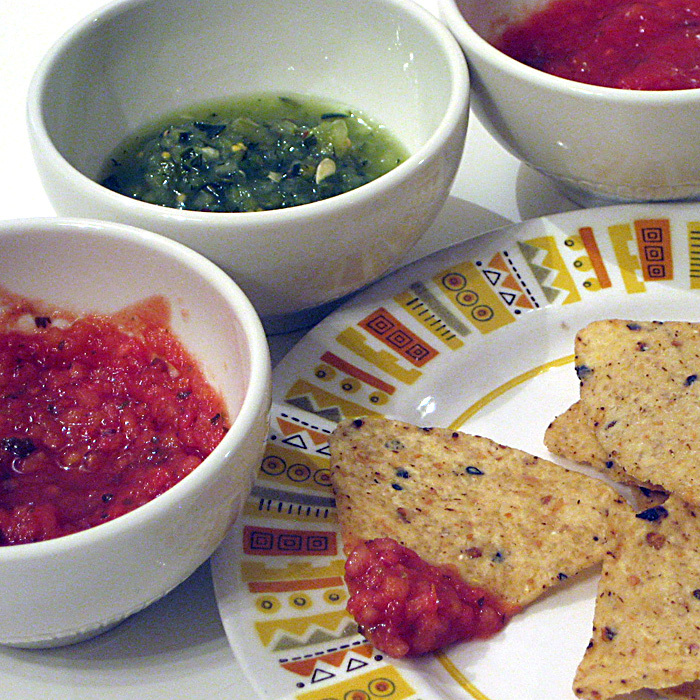 My son assisted me with tasting these products, drawing on his vast experience with chips and salsa. He thinks chips and salsa are the main ingredients of a healthy diet, so I was eager to get his opinion. 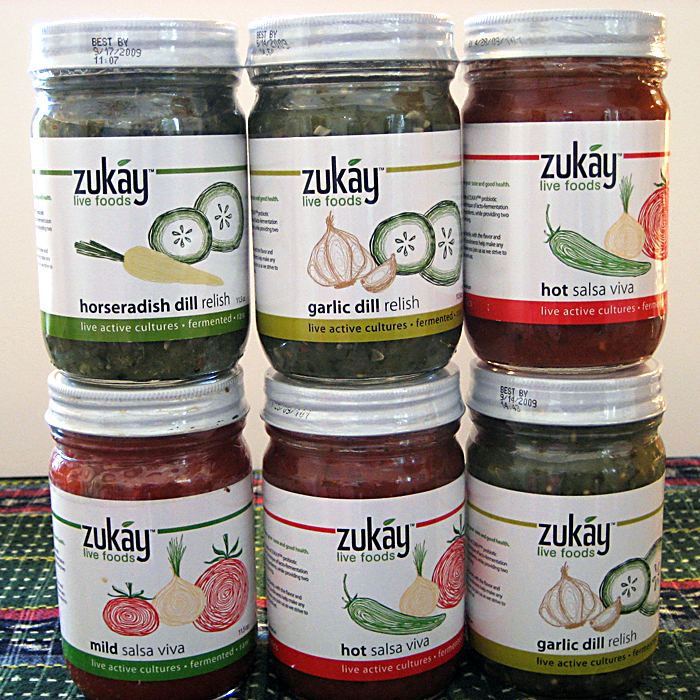 I don't think you can fairly compare these products to the more commonly available salsas and relishes on the market. They are kind of different. They have a slight fizz, for one thing, and they are lacking the strong vinegary and salty taste of commercial products. When you sample these foods, you can absolutely taste the fresh veggies and herbs that went into them. 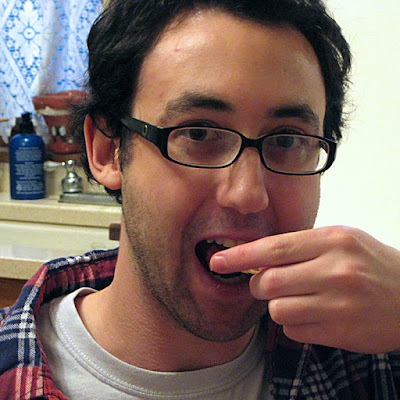 The relish tastes clearly of fresh cucumber and the other ingredients in the mix. It's like a little burst of summer. I'd have to agree with other reviewers that the hot salsa is lacking the heat you might expect from a hot salsa. Both the mild and hot varieties tasted very mild to me. They were pleasing, but not at all spicy, so if you are looking for heat, this may not be your best choice. The flavor grew on me as I sampled it, and I particularly enjoyed the "hot" salsa. It was more textural and interesting than the mild. The two relishes (garlic and horseradish) were yummy, with all of the flavors in good balance. I had garlic relish on my tempeh at dinner tonight and it really added sparkle. My son loves hot and spicy foods and these were a bit too subdued for his taste. Thanks to Scott, Cathy and Jacob Grzybek for including me in their sampling program. I've been spending a lot of time looking through my recipe collection, and it's bringing back old memories of food and cooking. 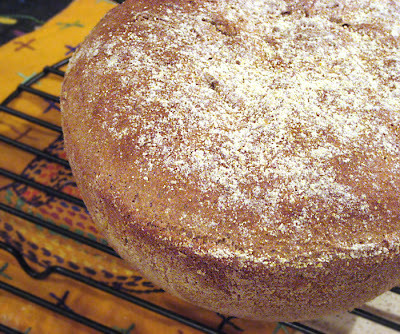 Back in my early days of vegan cooking, when cookbooks were very limited and nut-roasts and lentil-walnut casseroles were the latest, I was thrilled to find a recipe in my Country Life cookbook for a loaf with unlimited variations. As long as one followed the basic proportions of grains, beans, veggies, herbs, crumbs and liquid, an infinite number of combinations were possible, and countless delicious dinners awaited. To celebrate this momentous discovery, we invited friends for dinner, and I couldn't wait to show off scrumptious loaf variation #1. 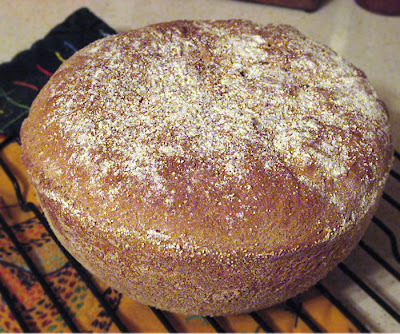 My friend Deborah and I were each preparing food for the meal when her husband looked at the loaf and declared, "everything you two make is brown." He had a grin on his face and I don't think he meant any harm, but I felt like I'd just been hit over the head with a 20 pound mushroom. Everything...I...make...is...brown? Could this be true? Brown? Brown? Brown? Why yes, I believe he may be correct. Everything is brown TONIGHT, but was everything brown yesterday? Will everything be brown tomorrow? I was stunned, deflated, sad. It reminded me of when I was in high school and was following an upbeat directive from Seventeen Magazine to discover my favorite color. "Just look in your closet," the magazine cheerfully encouraged, "your favorite color will be there." Will it be ruby? pumpkin? cerulean blue? I looked in my closet and there it was - my favorite color - brown! Even then, I was a nut loaf covered in mushroom sauce. By the time the Moosewood Collective published "Moosewood Restaurant Cooks at Home" in 1994, vegetarian cooking had become much more original. My friends Alan and Claire have been rediscovering recipes in their copy of Moosewood and I decided to take another look at mine in search of colorful and tasty food. I asked my husband to pick out something interesting and here's what he came up with. Is it brown? My husband says emphatically, "NO." I say maybe just a little beige, but in a very colorful way. It's a homey, comforting everyday dish that we really enjoyed. Bring a large pot of water to boil and cook the orzo to al dente. Drain and stir in 1 tablespoon of oil. While the orzo is cooking, saute the onions and garlic in 1 tablespoon of oil. When the onion softens a bit, add the carrots and pepper. Cook for several minutes and add the zucchini. Add the herbs and artichoke hearts. Gently stir in the the beans and tomatoes. Simmer for several minutes. 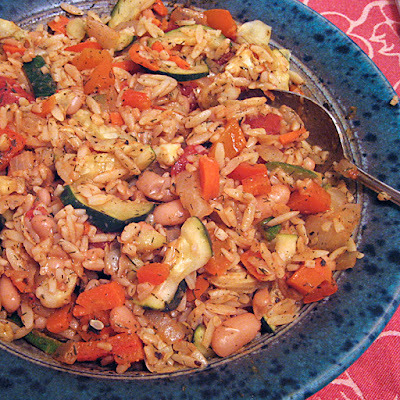 When the veggies are hot and cooked, stir in the orzo and season with salt and pepper. Add a splash of red wine vinegar (or serve at the table in a cruet). Serve with olives, bread and a green salad with toasted walnuts and dates. This may not be a Greek addition, but I think that dried crushed hot red pepper adds a nice flavor to this dish. The juicer giveaway has ended and the random number generator chose Caragonza as the winner. I've sent her an e-mail asking her to claim the prize and send me a mailing address by Tuesday. I hope I hear from her, but if I don't, I'll notify the next person on the random number list and so on until I find a winner. Congratulations, Caragonza, and thanks to everyone who left a comment! note: The winner has claimed her prize! The contest has officially ended. 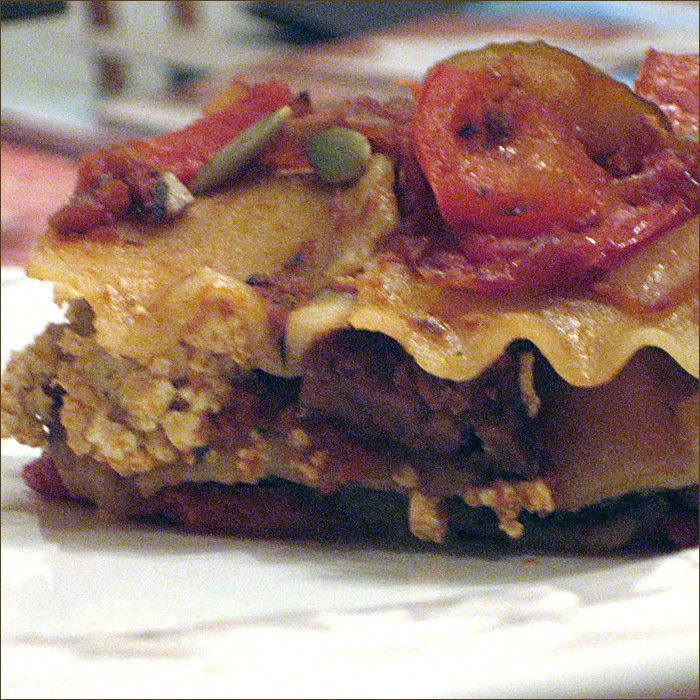 I've been digging around in the old recipe box again looking for forgotten favorites that I haven't made in years. I found one that surprised me the first time I made it, 100 years ago, because it tasted exactly like its name — English muffin bread. 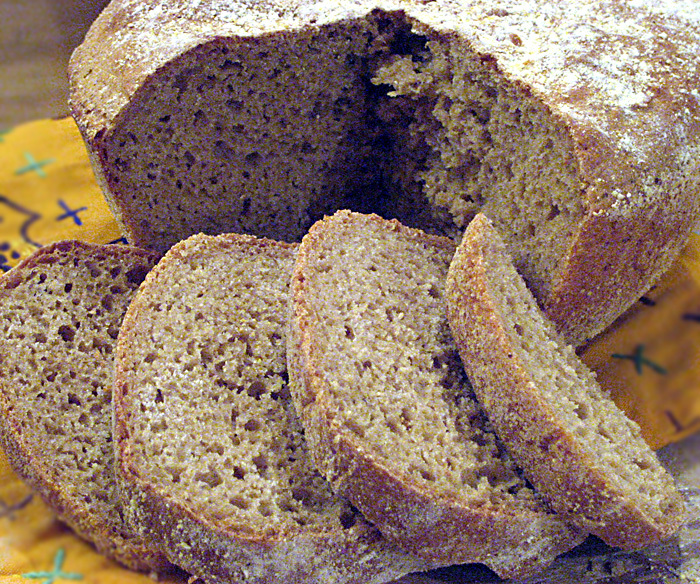 When I made it last night I decided to convert it to whole grain and see if the taste would still hold up. It's still got the open texture and slight tang of an English muffin, and when you toast and slather a slice with margarine, well, yes, it's very muffiny. I think the unbleached version is closer to a true English muffin, but the whole grain is so much healthier, and really good. It's got that chewy, slightly spongy texture and vaguely sour flavor that English muffins are known for. The original recipe was made in an electric mixer, but my mixer gave up its spot on the kitchen counter to the bread machine, and now resides in the basement. I was making the bread after a long day at work and didn't feel like hauling the mixer up to the kitchen so I beat it by hand with a wooden spoon. Honestly, its been so long since I've used this recipe, I couldn't say if not using the mixer made any difference in taste or texture. I'll give the original directions and let you choose whether to follow them or not. The recipe was cut from a magazine that I no longer recall, and was attributed to Lavonne Willard. If the author happens to see this, I apologize for stealing her recipe! Combine yeast, 1 cup flour, salt, sugar in mixing bowl. Heat water until just warm. Add water to dry ingredients. Beat with electric mixer (see story above) at low speed for 1/2 minute, scraping bowl. Beat 3 minutes at high speed. By hand, add enough of the remaining flour to form a soft dough. Place dough in greased bowl, turning to grease surface. Cover and let rise in warm place until double, about 1 hour. Punch down. Let rest 10 minutes. Grease a 1 quart casserole and sprinkle with cornmeal. Place dough in casserole and sprinkle top with cornmeal. Cover and let rise in warm place until double, about 45–60 minutes. Bake in hot 400˚F oven for 40–45 minutes, or until done. Since I'm on the subject of baking, might as well tell you about this cake. It's a recipe I got from this post. Considering that I have an underdeveloped sweet tooth, am not a chocolate addict and have never missed marshmallows, I can't explain my immediate fixation on this cake. From the moment I first laid eyes on its picture, I knew I had to have it. So the task of finding the ingredients became my mission. The challenge was Ricemellow, and no one in town carried it. I knew I could get it from Vegan Essentials* in Waukesha, but that's an hour away and I wasn't inclined to make the trip. My husband found a package of Sweet and Sara's vegan marshmallows at our local food coop and that's what I sliced and used. With my apologies to Diann and my huge respect for her cooking, here's what I changed. I used whole wheat pastry flour instead of AP flour. I used 1/4 cup of oil plus 1/4 cup of vanilla soy yogurt for the fat, and I reduced the sugar (sucanot) slightly to 3/4 cup. 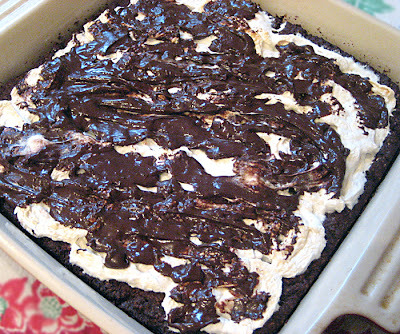 As noted above, instead of Ricemellow, I sliced several vegan marshmallows, and for the chocolate frosting I used about 1/4 cup of vegan chocolate chips, sprinkled over the hot marshmallow topping and swirled with a knife after they melted. Even with my changes, this cake was seriously addictive, and it didn't last long at our house. Much to my dismay and relief, my son gobbled it up before I had a chance to eat (a lot) more than I should. 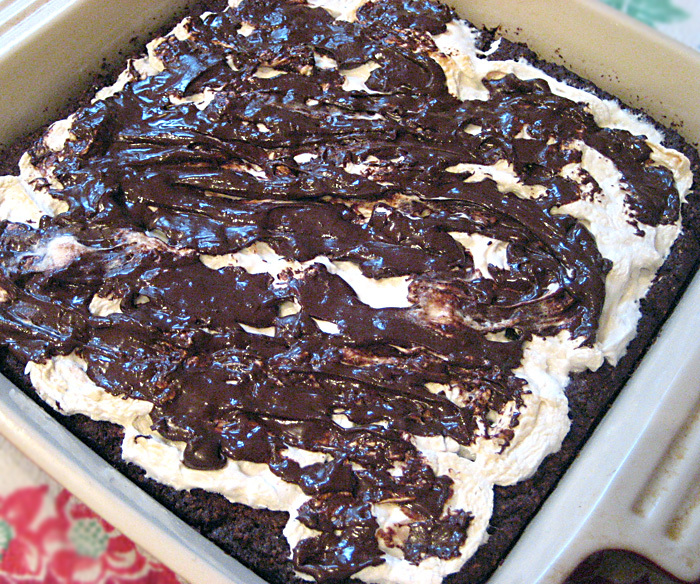 Bake the original version or this one for a delicious chocolatey indulgence. Thank you Diann! side note: Our food coop decided to carry Ricemellow and I now have a tub of it sitting in my pantry. As soon as I have a chance to try it, I'll post a review. *We visited their warehouse once. Whoa! Back in a past life when I was a grad student at Syracuse University, I had an assistantship that required me to work at the University child care center, providing care for children and mentoring student teachers. The daycare cook was a health-minded individual with whom I felt a great affinity. I was a vegetarian (not a vegan) at the time, and she cooked wonderful, mostly vegetarian food. 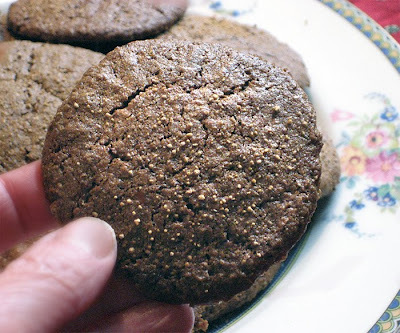 She had a recipe for a gingersnap type cookie that she made only rarely, because it stretched the outer limits of what could be considered healthy. Those cookies had way too much fat and sugar, but I acquired the recipe anyway, because the cookies were so darn good. The recipe came from a woman (Lillian Radway of Pompey, NY) the cook knew who lived in a small town near Syracuse. I got this recipe more than 30 years ago but, when I googled it today, I found similar ones that seemed to trace back to Betty Crocker. Who knew. Anyway, back in those days I was much more strict about what I would eat, and I had to make an exception for sugar when I ate these cookies. As delicious as they were, I never could quite bring myself to bake them because I was afraid that changing the recipe would ruin them, and I just couldn't bake them the way they were. But I've carried the recipe with me all these years, just in case. I finally decided to revise the recipe a bit and give them a try. I reduced the fat but not the sugar. Maybe next time I'll work on that! And they weren't ruined at all. They are just as chewy/crunchy/gingery and delicious as I remember. Cream together the oil, yogurt and sugar. I used a wooden spoon to beat the mixture until it appeared to glisten and lighten. Because oil doesn't form tiny air bubbles like shortening does, creaming isn't going to have the same effect on the finished product. So don't knock yourself out trying to "cream" the fat and sugar. Add the flax and molasses and beat thoroughly. In a separate bowl, combine the flour, salt, baking soda, ginger, cinnamon and cloves. I think the easiest way is to just put the dry ingredients through a sifter. Add the dry to the liquid and mix. The dough will be somewhat soft and sticky. Bake at 375˚F for 10-12 minutes until lightly cracked. I baked mine for 10. They come out of the oven very soft so leave them on the cookie sheet for several minutes to firm up before removing to a wire rack to cool. 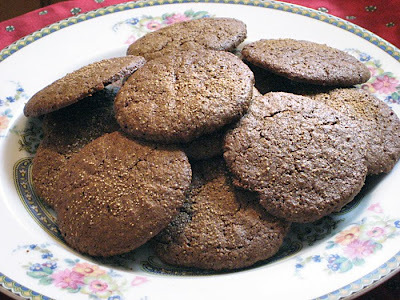 If you leave the cookies sitting out, they get nice and hard just like traditional ginger snaps. These cookies are much too good to have around so I froze half, and I'm sure it won't be long before I find out if they freeze well. note: Yes they do freeze well. And they are just as dangerous sitting in the freezer. We were sitting around trying to think of something to cook for dinner the other night. It was almost six o'clock and we were hungry but clueless. I was thinking soup would be good, and I was trying to imagine what it should taste like when quinoa soup popped into my head. 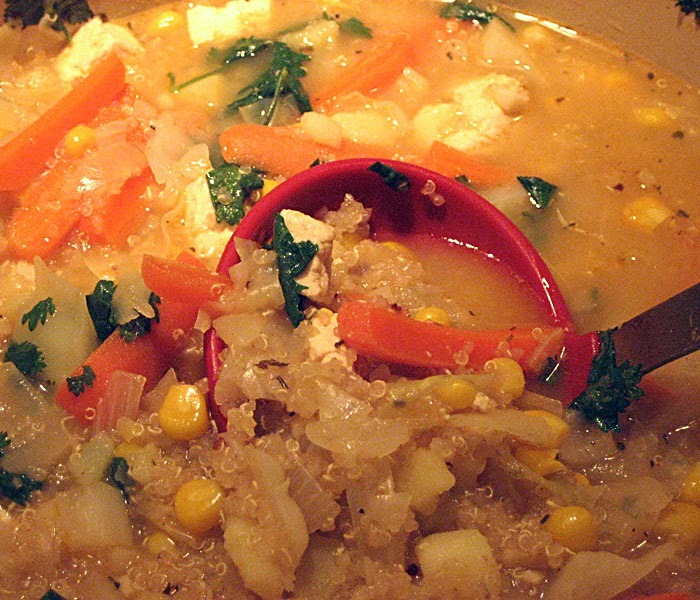 Quinoa soup was the subject of one of my first posts (probably read only by my immediate family! ), and it's still one of my favorite soups, but for some reason I always forget about it. It's fast, easy and delicious — in other words — perfect. This seems like a good time to mention it again, along with some of the memories it invokes. Now, about that rain forest. When we visited our middle son, we spent some time in Quito, and then took a trip to an eco-tourism lodge in the Amazon. The night before the trip, we ate in a hole-in-the-wall restaurant in Quito that Aaron swore was okay. We'd so far been very careful about food so as not to get sick... Well, I was up all night unloading, if you know what I mean. By morning I was in a very fragile state, and begged my husband to go on the trip without me. I really couldn't picture myself away from a nice bathroom for more than a few minutes at a time. He refused to leave me and I didn't want to ruin the trip, so I reluctantly packed my bag. My waiting room at the Quito airport was the bathroom, and I didn't come out until it was time to board. When I saw the tiny little plane I was horrified, but when I saw the flight attendants handing out snack bags to the boarding passengers, I was even more distressed. I knew I'd be unable to accept the bag, or even politely refuse it, without barfing, so I asked my husband to please take my bag while I stared rudely at the ground, and imagined myself someplace else. I survived the flight by keeping my eyes shut and sleeping as much as possible — not hard since I'd been up all night. The kids were begging me to look at the Andes, but really, I couldn't. I felt bad about that, but at least I didn't throw up. We flew into the oil town of Coca. Let's just say this was not a destination town, rather, it was a starting point for many trips into the Amazon. When we were there, a taxi ride was "stand-up and hold on" in the back of a pick-up truck. The bathroom at the airport was so awful, that I could only use it because I was desperate, and I had to clean it first, which was hard without running water. The toilet seat was covered with human excrement. No joke. All I had were a few tissues. At Coca we boarded a motorized canoe for a three-hour trip down the Rio Napo to the lodge. It was an amazing ride down an Amazonian river, and that thought distracted me just enough to survive the trip, climb up the steep river bank, hike to the lodge, and find a bathroom. When I didn't show up for dinner that night, a medical assistant was sent to our room, and a herbal tea was proffered. By this time, our youngest son was queasy and chucking, so he was given the tea, too. I've never tasted anything so vile in all my life, but after a quick consultation with each other, we both drank it. By morning we were feeling weak, but better, and we entered into a full day of hiking in the rain forest, and other activities. This was an unforgettable trip to an amazing place. The lodge staff was working hard to provide medical care, education and jobs in an area previously without access to those things, while preserving primary rainforest and investing in re-establishing rainforest that had been destroyed. We visited the clinic, the canoe ambulances and the chocolate factory! Our guide was from a remote village in the jungle and he had an intimate knowledge of the rainforest flora and fauna. Hiking with him was a revelation. I'll never forget him cutting a thick stem of cat's claw and letting us drink the liquid inside. He pointed out plants and animals (and big hairy tarantulas) that we never would have seen without his help. I could ramble on for hours about our experiences in Ecuador. When we eat quinoa soup, it's more than just a meal. It reminds us of another part of the world that we've been fortunate enough to have visited and people we were lucky to have met. I'm delighted to be offering you a chance to own a Lexen manual wheatgrass and leafy greens juicer absolutely free. Andrea's easy vegan cooking will be holding a contest for a FREE Healthy Juicer from Lexen Products. The press materials state that the Lexen Healthy Juicer is an amazing, easy and effective wheatgrass and leafy green juicer, making it the most popular on the market. 877MyJuicer.com will be supplying and shipping the juicer at no cost to the lucky winner. More detailed information about the juicer can be found here: Healthy Juicer. Just leave a brief comment about why you would like to have this juicer or simply a statement that you would like to have it. Each comment will get a number in the order in which it is received. The numbers will go into a random number generator and a winning number will be selected. The winner will be notified on this blog. Once I receive a mailing address from the winner, the juicer will be mailed to you. The event is open from Jan. 11 to midnight, Jan. 24 and, sorry to say, is open only to residents of the U.S. That is, the juicer can only be shipped to a U.S. address. Again, my apologies. The odds of winning will depend on how many entries there are. The winner will be announced on this blog on Jan. 25. The winner will have two days to claim the prize. If no one claims it, a second winner will be selected, and so forth, until a winner claims the juicer. This process of crushing and squeezing extracts more juice and also has less heat build up than from the high speed at which centrifugal juicers work, which destroys the enzymes and other vital nutrients. The Healthy Juicer produces a healthier juice! 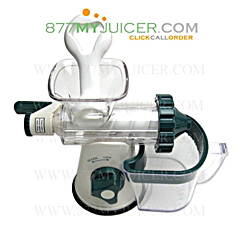 I haven't personally used this product, but 877MyJuicer.com has offered to give one away to one of my readers, and I'm excited to be passing that offer along to you. I know the lucky winner will enjoy using it! Please note that it is a manual wheat grass juicer meant for wheat grass and leafy greens. It is NOT an electric juicer for hard fruits and veggies. My husband had some dental surgery, and for the first couple of days he could only have liquid or very soft foods. 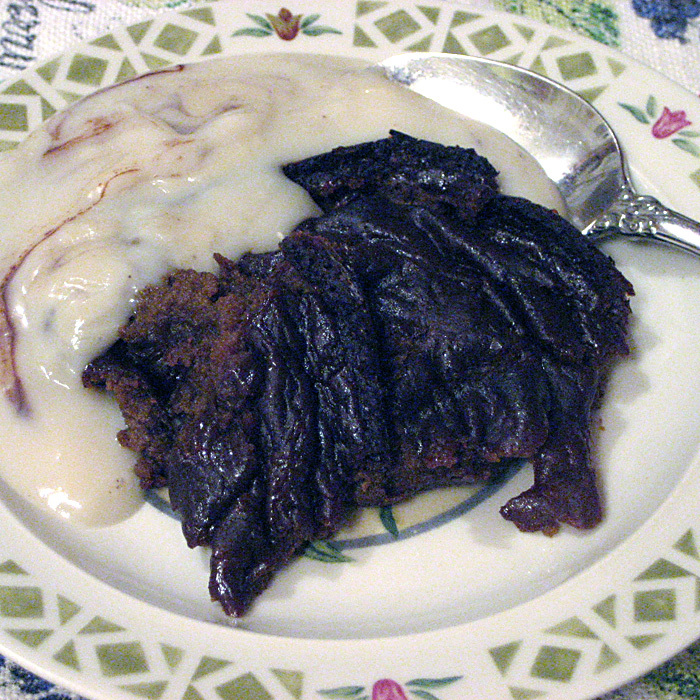 I made sieved applesauce cooked with three varieties of apples, a cinnamon stick and crystallized ginger; arrowroot pudding made with soymilk and maple syrup with a swirl of chocolate chips; baked pumpkin pudding with blackstrap, agave and spices; and red lentil soup with ancho chili pepper and truffle oil. Just because the diet is soft doesn't mean it has to be bland. I know the photo above makes the pumpkin look really weird and kind of like dried dog poop, but it tasted amazing. It's on my "why didn't I measure anything and write it down" list. 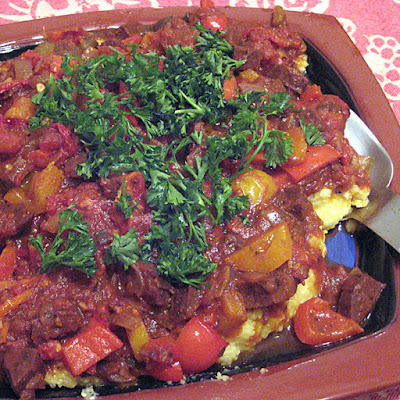 As soon as he could have soft vegetables, we had Garden Bolognese Sauce adapted from a recipe in "Vegan Italiano" served over oven-baked polenta. The next day, I bought some gluten-free rice lasagna noodles, and used the (thinned a little) leftover sauce, sautéed zucchini and eggplant, and some tofu ricotta to make lasagna. The noodles were the kind that don't need to be precooked, so it was an easy dish to prepare. Relatives in Connecticut went to a Mad Men-themed New Year's Eve party where guests were supposed to come in Mad Men appropriate attire and munch on food from the era. It's such a great idea—I was really jealous. The hosts served stuff like pigs in the blanket, deviled eggs, brisket cooked in Coca Cola, celery stuffed with cream cheese, Swedish meatballs, jello mold and whiskey cake. Hmmm. I wonder what the vegans ate in the 60s - probably brewers yeast loaf and rice patties! Most vegan bloggers today probably weren't even born in the 60s, or were too young to be cooking. I was there, but still at home with my parents, and not cooking or thinking much about food choices. Some of the above foods, like the brisket in Coke and the whiskey cake, I've never heard of, but the others are at least familiar. (I just recently stuffed (tofu) cream cheese into celery!) But I have a clear memory of Swedish meatballs. 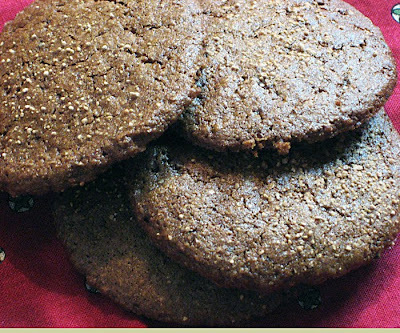 Those were popular for a long time, and I remember my aunt serving them and telling me, with great excitement, her "secret" recipe. She mixed a bottle of ketchup and a can of 7-up to achieve the unique flavor of the sauce that made the meatballs the special treat that they were. Do people still do this? I wonder. I almost considered creating a vegan version but then had second thoughts. Instead of 1960s American party food, here is a post about the timeless Indian cuisine that we enjoyed on New Year's Day. My son wanted to make samosas for dinner and he found a video on the Internet with step by step directions. After consulting with me, he made a couple of changes to the recipe. He used white whole wheat flour and whole wheat pastry flour for the crust (had to add more flour than in the recipe), and he baked them instead of frying them. I didn't see him make the filling but he said he used carrots instead of peppers. 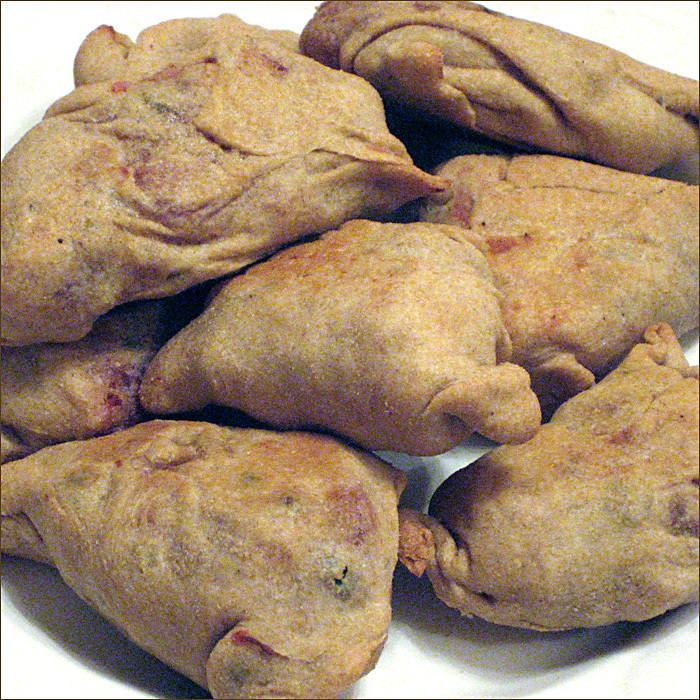 He rolled the pastry really thin and the resulting samosas were fantastic—light and delicate. They weren't heavy and greasy like they sometimes are at restaurants. The pastry he used to make 8 samosas used only 1 teaspoon of oil plus a light spray before baking! 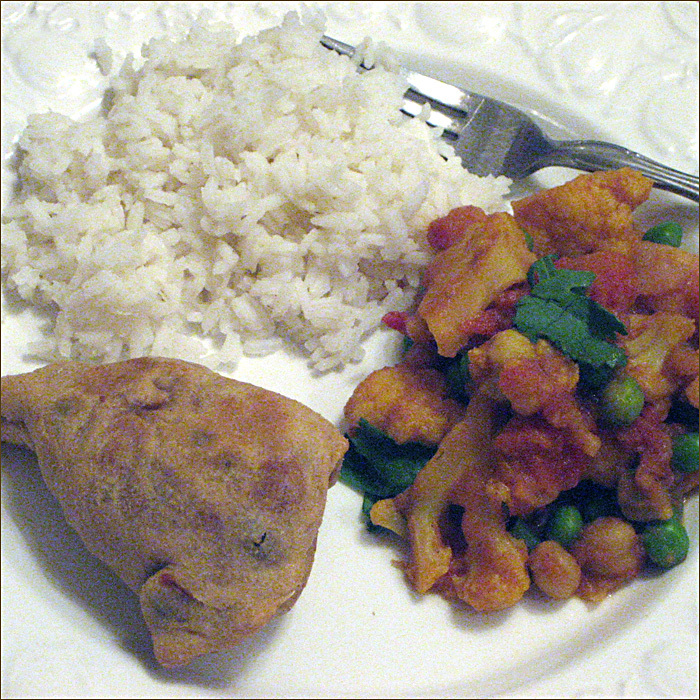 To go with the samosas we had a low-fat variation of aloo gobhi with the addition of peas and garbanzos. It was tasty and satisfying. The recipe was adapted from a book we found at our local library. Potatoes, cauliflower, peas and chickpeas (Aloo gobhi matar chana) adapted from a recipe in "Indian Light Cooking." Steam the potatoes, covered, in a small amount of water for about 5 minutes. Add the cauliflower and steam about 5 minutes more until almost tender. Add the drained potatoes and cauliflower (just remove them from the steaming pan with a slotted spoon) and chickpeas, and stir fry until they are lightly browned. Add the tomatoes and cook 1 to 2 minutes. Cover and cook for 3 to 4 minutes or until the vegetables are tender. Add salt to taste. Garnish with coriander. Here's a recipe adapted from the New York Times. 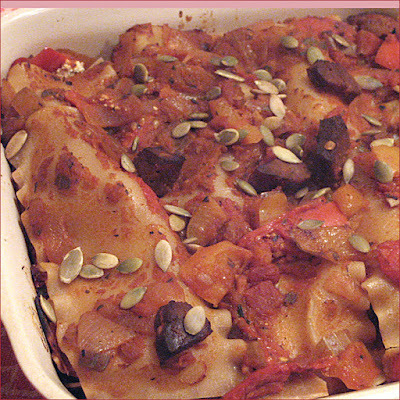 It's hearty without being heavy, easy to make and very nourishing. 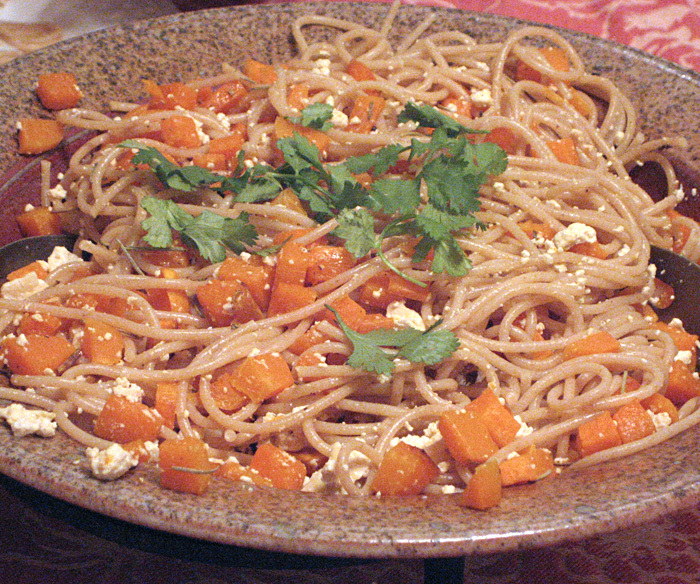 It pairs butternut squash with pasta. The original called for ricotta salata, a dry, salty form of ricotta that has been replaced here with tofu. I like to use whole wheat spaghetti (we're very fond of Whole Foods 365 store brand) but you could use your favorite pasta shape and formulation for this yummy entrée. Any dry winter squash would work here, but we already had butternut in the house. The tofu is mixed with umeboshi paste and tahini to give it a slightly salty, zesty edge, but if you don't have umeboshi paste you could probably substitute some lemon juice and miso or salt. Umeboshi paste, plums and vinegar are very useful flavoring items. Used primarily in Japanese cooking, they make interesting additions to salad dressings and other dishes. I use it when I make sushi and it's great in the summer on fresh corn on the cob. In addition to being delicious, umeboshi is supposed to have health benefits, especially as an aid to digestion. Preheat oven to 450˚ Cover a baking sheet with foil. 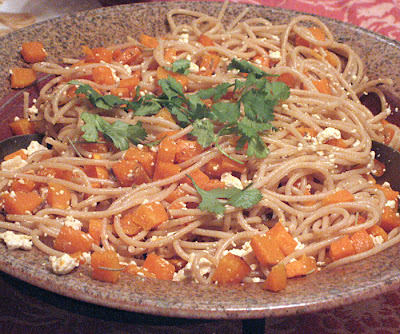 In a bowl, toss the squash with the garlic, pepper, herbs and i tablespoon of oil until the squash is coated with oil. Transfer to the baking sheet and roast in the oven for 30 minutes, or until tender and caramelized. Remove from the heat and transfer the squash to a wide serving bowl. Squeeze out the roasted garlic and add to the bowl, tossing gently with the squash. Keep warm. While the squash is roasting, bring a large pot of water to boil. Cook the pasta according to package directions for al dente. Aim to have the pasta cooked just after the squash is ready. Add about 1/2 cup of the pasta cooking water to the squash. 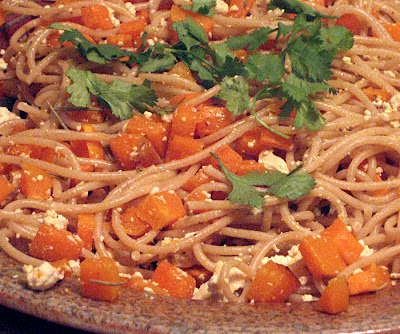 Drain the pasta and and add it with the tofu (see below), to the squash. Mix the noodles and tofu gently with the squash, remaining tablespoon of oil and the parsley. Tofu ricotta: Place the tofu in a small saucepan and cover with water. Bring the water to a boil and cook the tofu at a slow boil for five minutes. Drain the tofu and place in a small bowl. Press out as much water as you can with a fork or by using your hands. (Let it cool a little first.) Mash the tofu with a fork and mix in the umeboshi and tahini. It should resemble the texture of ricotta.